Amazon | What is the ultimate destiny of our universe? That is the striking question addressed by James Gardner in The Intelligent Universe. The cosmos might end in fire — a cataclysmic Big Crunch in which galaxies, planets, and life forms are consumed in a raging inferno as the universe contracts in a kind of Big Bang in reverse. Or the universe might end in ice — a ceaseless expansion of the fabric of space-time in which matter and energy are eternally diluted and cooled; stars wither and die, and the cosmos simply fade into quiet and endless oblivion. 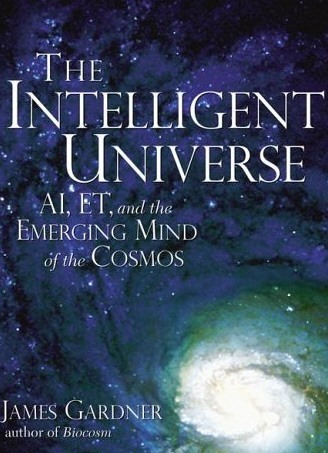 In The Intelligent Universe, James Gardner envisions a third dramatic alternative — a final state of the cosmos in which a highly evolved form of group intelligence engineers a cosmic renewal, the birth of a new universe. Gardner’s vision is that life and intelligence are at the very heart of the elegant machinery of the universe. It is a viewpoint that has won outspoken praise from an array of leading scientists, including Sir Martin Rees, Britain’s Astronomer Royal, and Templeton Prize winner Paul Davies.